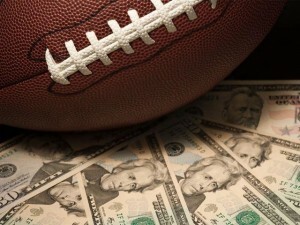 The recent barrage of advertisements from big daily fantasy sports companies such as DraftKings and FanDuel have taken a lot of scrutiny over their overall message: “anyone can win every day, and anyone can win big.” The same statements from past winners on the two thriving sites have rung loudly, but do they ring true? The popularity of the new trending past time has brought questions of the game’s legality and whether or not the elements of chance outweigh skill. However, FanDuel and DraftKings advertisements tell a completely different story. So, are these advertisements misleading? The overall decision on whether the game is legal was made in 2006, almost ten years ago through the Unlawful Internet Gambling Enforcement Act. The doctrine put an immediate halt to all financial transactions to sites that operated as a gambling platform. Sports betting availability was also eliminated from US households, as well as many online gambling games such as slots and poker. However, the act did not include fantasy sports and in fact exempted the game due to its basis as a skill game. Before this decision was made, members of US Congress examined the concepts and components of the game. With consideration of statistics and useful knowledge, it clearly fell under the category of skill rather than chance. However, some state's still choose to ban the gameplay claiming that it does in fact have too much luck involved. Regardless of the 2006 decision made by the US Congress, the industry of fantasy sports betting is once again being investigated. A large reason for the recent audit is due to financial information rumoring that a majority of the prize money is won by less than 1 percent of participants. The report paints a perfect metaphorical picture of a small number of sharks feeding in a large pool of minnows. However, that theory is the last thing DraftKings and FanDuel want going through their customer’s minds. Unfortunately, them pushing the idea that anyone can win big has backfired on the behemoth companies, causing their systems to be under even more intense scrutiny. 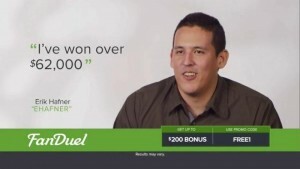 While most winners on the ads seem realistic, the companies also throw in Scott H, whom everyone knows is the average Joe that states, “I've deposited a total of $35 on FanDuel and won over two million.” However, that is far from the norm as similar to a casino; there will always be winners who get the last laugh, which is why the elements of chance for the game are being examined. Under the revised Guides, advertisements that feature a consumer and convey his or her experience with a product or service as typical when that is not the case will be required to disclose the results that consumers can generally expect clearly. In contrast to the 1980 version of the Guides – which allowed advertisers to describe unusual results in a testimonial as long as they included a disclaimer such as results not typical – the revised guides no longer contain this safe harbor. The major daily fantasy sports companies have evaded the Federal Trade Commission's mandate thus far, but could face new regulations. The powerhouse corporations have made far more than a splash and are currently on more than just the FTC’s radar for inspection.